The Side Bar and Grill is the summertime place to be, for a cool refreshing drink or to enjoy one of their famous burgers with all the fixings. 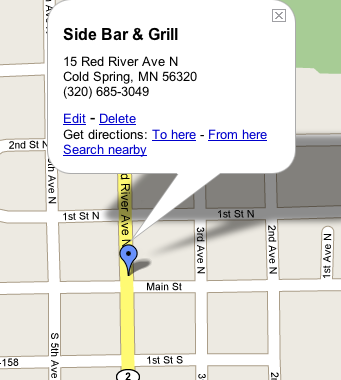 At the Side Bar & Grill there's plenty of room for the entire family to enjoy an evening out. Whether its a bite for lunch or an evening socializing with friends, the Side Bar & Grill is funtime during the summertime. Located in downtown Cold Spring across the street from the Post Office.